ECHO, the island’s only oceanfront indoor/outdoor dining, offers breakfast, lunch, and dinner daily. The culinary team’s long standing relationships with coastal farmers and purveyors have helped to create a one-of-a-kind menu of seasonal favorites. 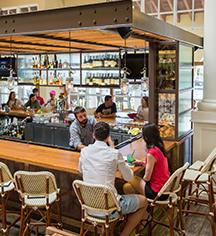 ECHO’s bar offers something for everyone, with extensive lists of wines, beers, and handcrafted cocktails. The poolside Sea Shack Bar and Bites, open seasonally, offers a lighter fare menu. Room service is available until 10 PM. 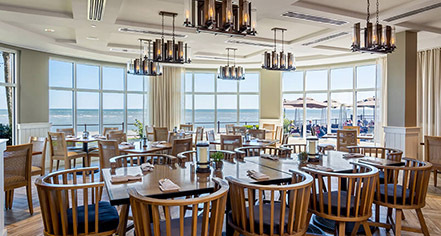 The historic Delegal Room boasts beachfront views and ornately stained glass windows, hosting special holiday meals, and private banquets.